Videos, examples, solutions, and lessons with examples and solutions on calculating the distance between two given points on the Cartesian coordinate plane. how to derive the distance formula from the Pythagorean Theorem. how to use the distance formula. Check out the distance formula calculator near the end of this page that can calculate the distance between two points. Use it to check your answers. 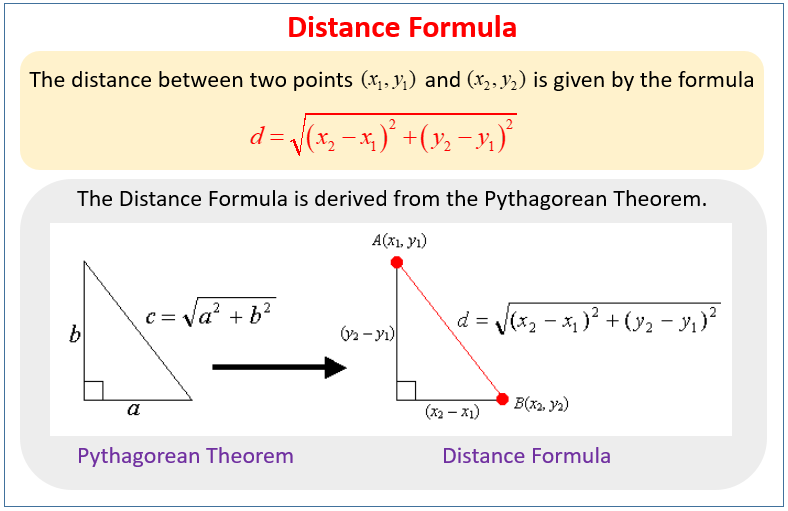 The following figures give the Distance Formula and how the Distance Formula is derived from the Pythagorean Theorem. Scroll down the page for more examples and solutions. In the coordinate plane, we can use the distance formula to find the distance between any two points. The distance formula can be derive from the Pythagorean Theorem. The distance between the two points (x1,y1) and (x2,y2) is given by the distance formula. To find the distance between the points P(2, 3) and Q(1, 1). We can sketch the right-angled triangle PQR with PQ as the hypotenuse. Find the distance between the points A(1, 2) and B(-3, -2). Worksheet 1, Worksheet 2 to calculate the distance between two points. How the distance formula comes from the Pythagorean Theorem? Example of finding the distance between two points. This distance formula calculator can calculate the distance between two given points on the coordinate plane.